SC5 Online toteutti Windows 8-ratkaisun uutisten lukuun YLE:lle. Toteutuksessa on monia innovatiivisia ominaisuuksia, kuten kehittynyt filtteröinti uutissyötteelle ja erittäin nopea käyttöliittymä, joka perustuu Microsoftin Metro-konseptiin. SC5 developers were very fast in grasping the concept and carrying out the development. 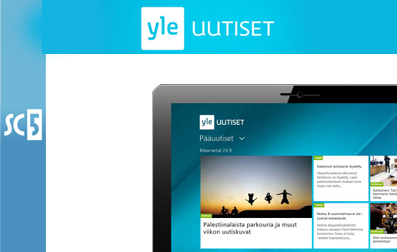 They were very professional both in their know-how of the new platform as well as in their co-operation with YLE. We are very satisfied with the quality of their work and can wholeheartedly recommend SC5 as a partner.